Even though you’re still waiting for winter to end, it’s never too early to brainstorm for some summer fun. Perhaps you’re considering a catering a barbecue lunch with friends and family. 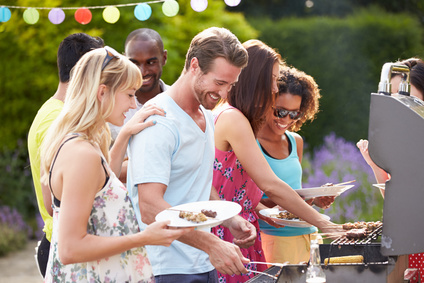 Private parties are fun to host and a barbecue is great for summer holidays, like the Fourth of July or Labor Day. How fun would it be to have fresh, well prepared food served to your guests without even having to cook or cleanup? When you get in touch with a Detroit catering company, you’ll be surprised what kind of services they can offer for your barbecue bash. Whether you’re a good cook or not, a caterer will be happy to bring you and your guests’ dishes full of flavor. Perhaps you’ve been wondering what can and can’t be grilled? Professional caterers can show you a variety of treats whether you want more meat or want to grill for your vegan friends. To make sure none of what you ordered is wasted, have a discussion with your guests beforehand to see what works for them. This will make it easier to help everyone be happy at your event. Once you look at the menu and decide what sounds good, take a look at the price. A catering company will help you get the food you want without breaking bank. In fact, don’t be afraid to ask about package deals that may save you some money so you can plan for other things. Most people worry that BBQ catering is simply a food delivery service. Professional caterers also offer help with making your event as extravagant or casual as you’d like. Ask the caterer about rental services that will allow you to borrow chairs, tables, tents, linens and even china for a fee. These kinds of services can help you create a welcoming atmosphere, but you’ll also need to keep the temperature in mind. If it’s a warm day, you’ll have refreshing beverages, but perhaps you’ll want seating that’s in the shade or under a tent to keep your guests comfortable. Whether you want your event to be formal or casual, a professional caterer can get the job done. Some Detroit catering companies offer wait and bartender services. Your guests would appreciate a wait service, since it’s inconvenient to move around a lot on a hot summer day. If you have a party going on, perhaps a bartender can help your guests loosen up. Although this privilege comes with an additional expense, it’s an option to consider when you’re thinking about how memorable your barbecue can be. Need BBQ Catering in Detroit this Summer? When the summer finally arrives and you can’t stop thinking about how much fun a barbecue would be, talk to a Detroit BBQ catering company. If you happen to live in Southeast Michigan, David Graham Events is highly recommended. Contact them and receive a quote today.